It's amazing how Jean Claude Constantin keeps surprising me even after dozens of reviews for his puzzles. This one, the Bouchons (French for corks), is one of the most original designs, using everyday objects, I've ever seen. 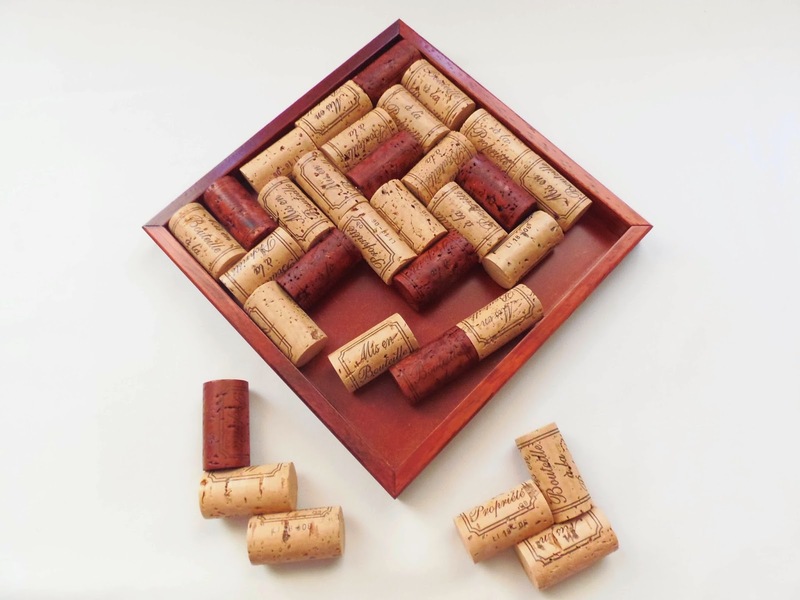 At first sight, the puzzle looks just like 32 regular corks put together inside a square tray. 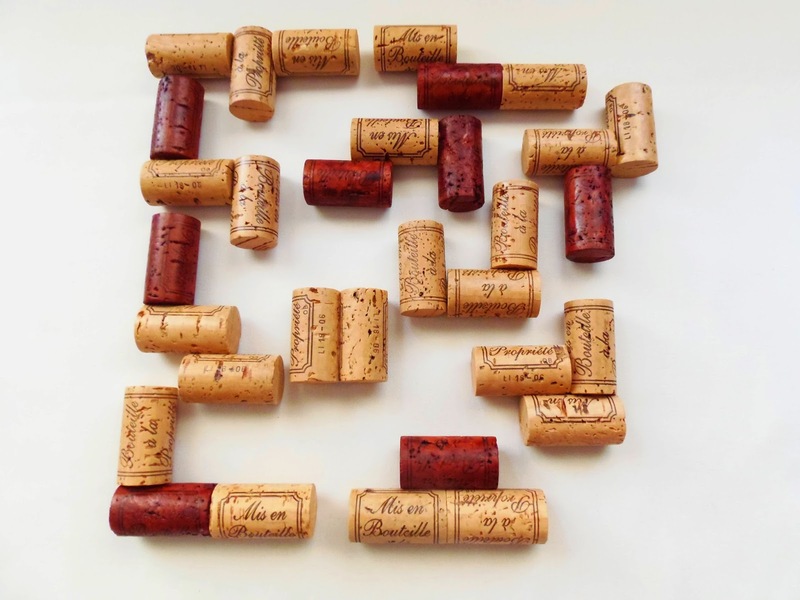 However, when you start taking the pieces out you'll see that they are joined together in groups of three (except for one piece with two corks) with different configurations. In total, there are 11 pieces, all unique, and they're made out of real corks, not wooden imitations. Some corks have a darker color, which offers a nice contrast to an otherwise bland appearance. Even here, Constantin is always thinking of aesthetics. 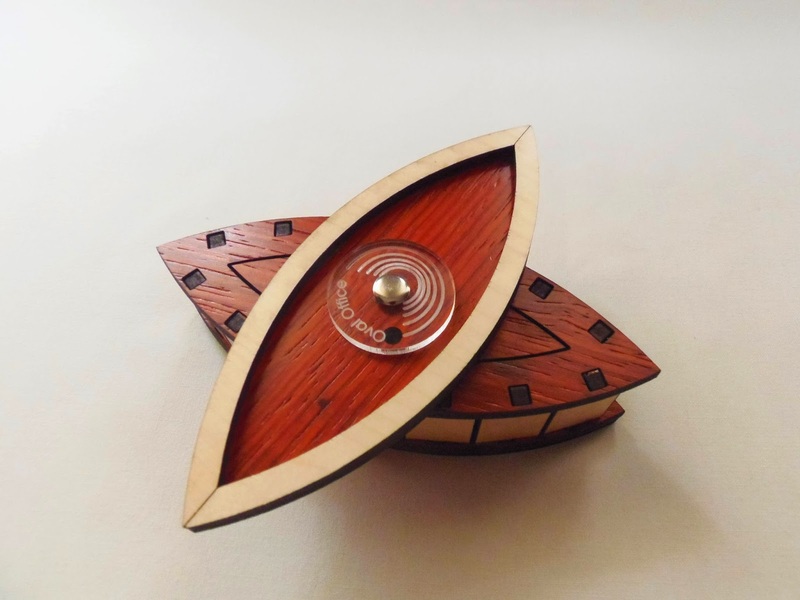 The puzzle is quite big, measuring 21.4cm (8.4") in diameter, but extremely light in weight due to the nature of the pieces, as 90% of its total weight is from the tray itself, which is built from natural wood. Since this is a packing puzzle, the hard part comes after you take out the pieces and try to put them back in the tray. This is no harder than an average packing puzzle, but no picnic either, as the 11 pieces will certainly offer a pretty good challenge for most puzzlers. PuzzleMaster classifies it spot on as a difficulty level 8/10, which in terms of solving time should take anywhere between half an hour and a couple of hours. It took me about an hour and a half with a break in between. Like most puzzles, my advice is that if you find yourself in a jam, give it a rest and return with a fresh mind after a while. A break solves many things, and in this case, it surely is a big help. When you first take out the pieces, be careful separating them because some may be stuck together and you could break their joints, since they're packed pretty tight. When you put them in the tray again they'll move around relatively loose. Bouchons is simply a fantastic puzzle. Not because of the concept, which is a regular packing puzzle, but because of its design. It really takes originality to a new level, using unexpected materials that we don't usually associate with puzzles. 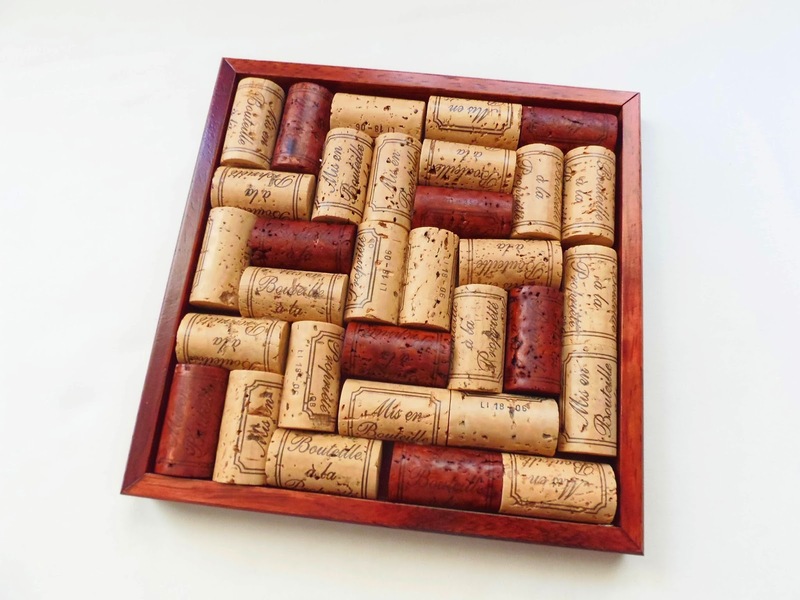 As cleverly mentioned in its description at PuzzleMaster, this puzzle together with the Einer Geht Noch puzzle make a perfect gift for wine lovers. Availability: The Bouchons puzzle is available at PuzzleMaster for $38 CAD. Click here for other designs by Constantin. Usually, most of the packing puzzles you see are either made with square/rectangle or circular trays - Pretty bland in terms of design. 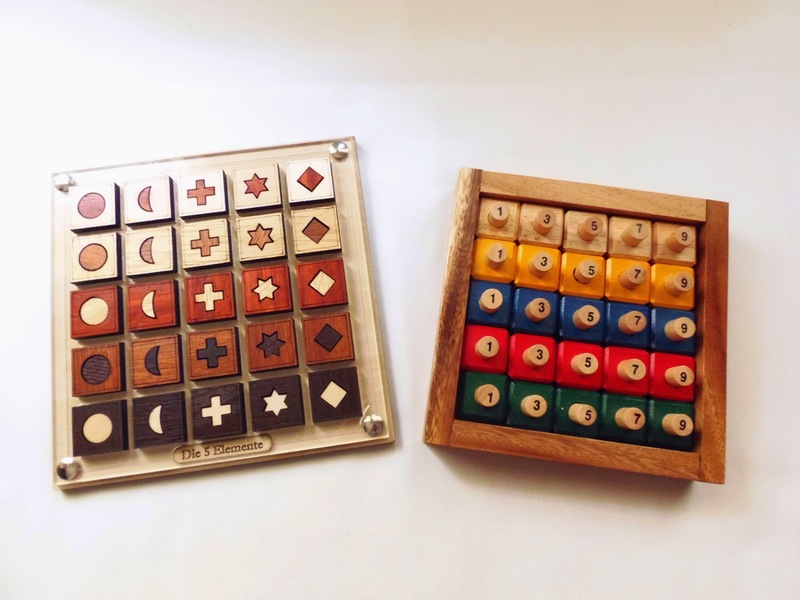 Siebenstein-Spiele, by the hands of the extremely prolific Jürgen Reiche, not only escaped from the traditional shapes, but also made a beautiful and original puzzle, The Moon (Mond), in the shape of a waning crescent Moon. 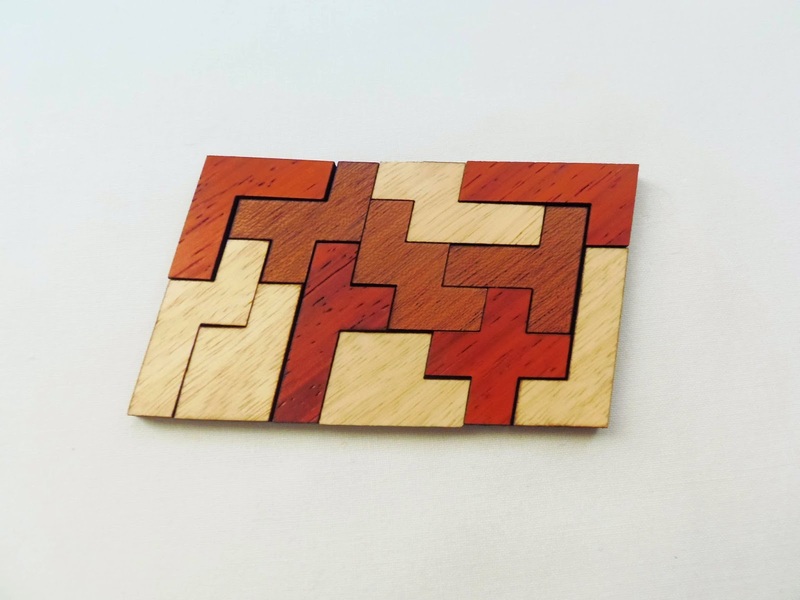 Made with two wood colors to differentiate between the pieces, the puzzle is quite small considering the average size for packing puzzles, measuring 8cm x 6cm (3.1" x 2.4"). 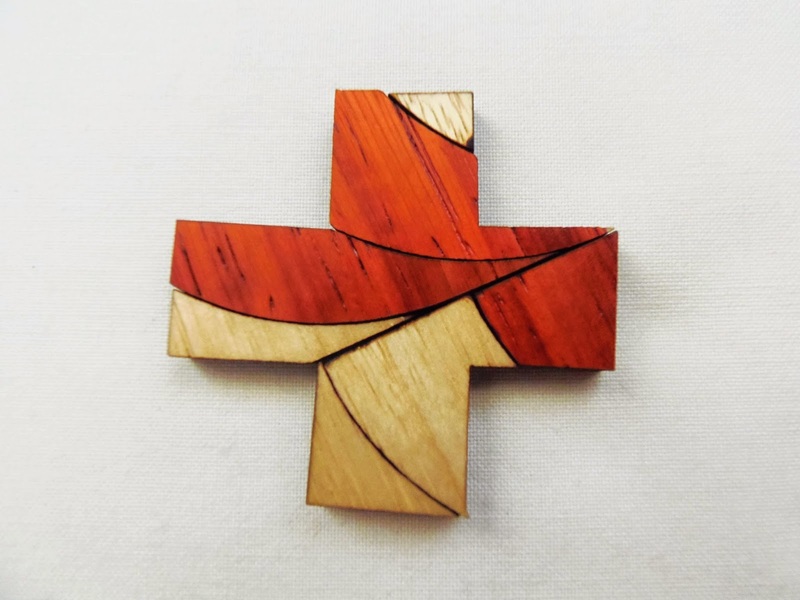 Honestly, in this particular design, I'd rather see a unique color for the pieces (dark brown) to make it more challenging, and also because I believe it would've made more sense aesthetically. Comprised by seven uniquely and irregularly shaped pieces, The Moon actually presents two challenges: the one you already see, where you just need to pack the pieces inside the small area; and a second challenge, much harder, where the goal is to make a cross with the very same pieces. The puzzle is classified as a level 8/10, and I totally agree with it. It's quite challenging. The Moon (Mond) is an absolutely stunning little puzzle. It's small size is deceptive, so don't underestimate it. It's also a beautiful decoration piece for your work desk or a coffee table, and surely will be the topic of many conversations. Hopefully you can convince some friends to join the puzzle craze. 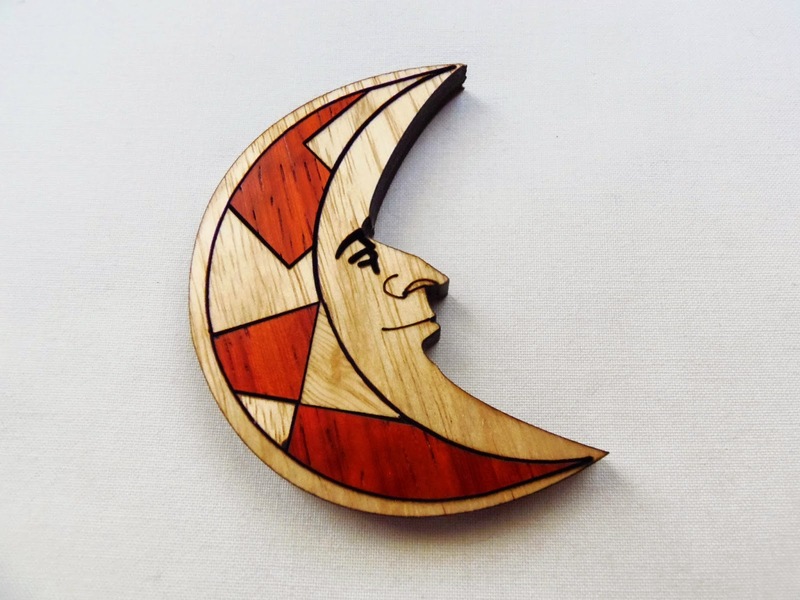 Availability: The Moon (Mond) is available at PuzzleMaster for just $11 CAD. For more Siebenstein-Spiele designs click here. Deal of the Week: This week, you can get 15% off on all Siebenstein-Spiele puzzles. You just need to mention my blog when you place your order. Offer valid until April 25. Pentominos are probably the most recognizable shapes in packing puzzles and certainly the most used in puzzle design. 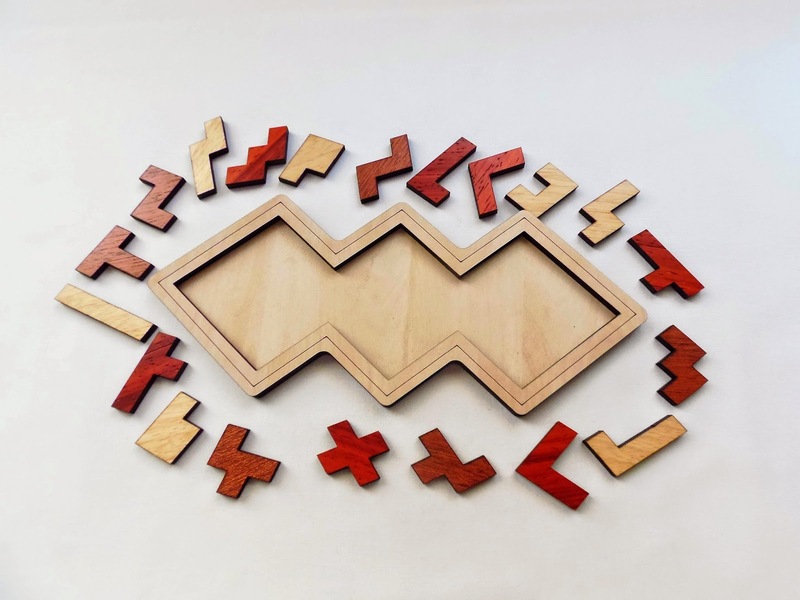 There are literally countless ways to design a puzzle using the 12 known shapes (a pentomino is comprised of five equal units joined together), but the puzzle you see above actually has more than 12 pieces, it has 20, albeit having duplicates. 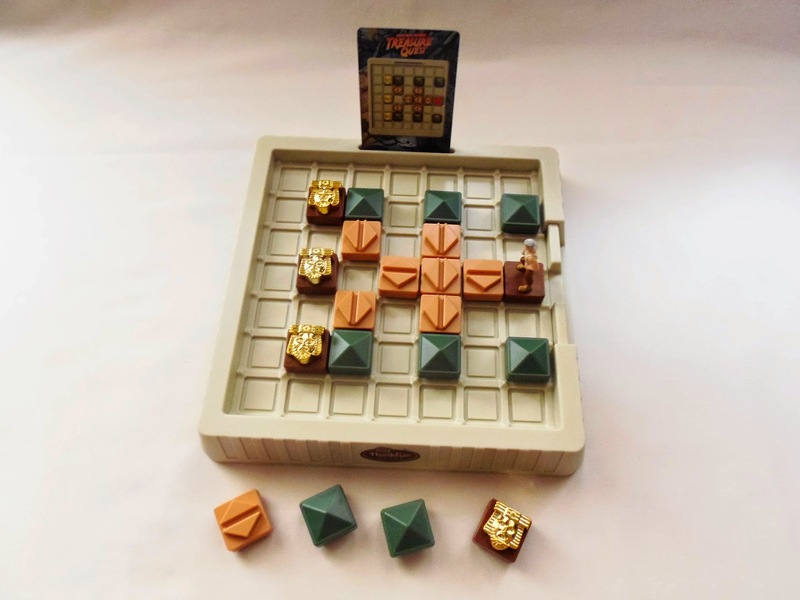 It was designed by Jürgen Reiche and produced by Siebenstein-Spiele. 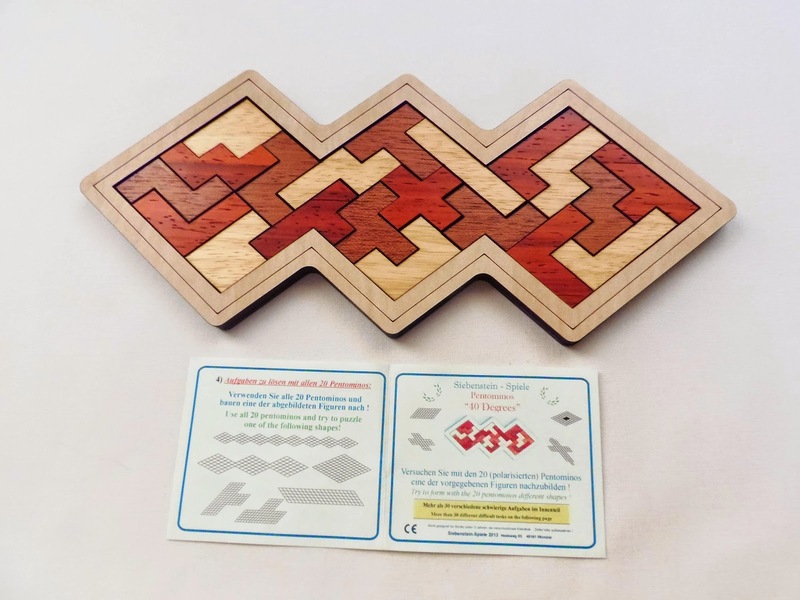 What's different about this puzzle - from all other pentomino puzzles for that matter - is that the pieces were cut with a 40 degree angle, making it all the more challenging. There are several shapes for you to try with the included instructions, using all or some of the pieces, but if you're used to this type of puzzles you know that there many other shapes to try and build, way too many to count. The Pentominos "40 Degrees" were made in Siebenstein style, using different wood tones to create a dramatic effect in contrast. The shape of the tray is like three rhombi were fused together and, despite the small size of the pieces, it turned out pretty nicely, measuring 24cm x 10cm (9.4" x 4"). 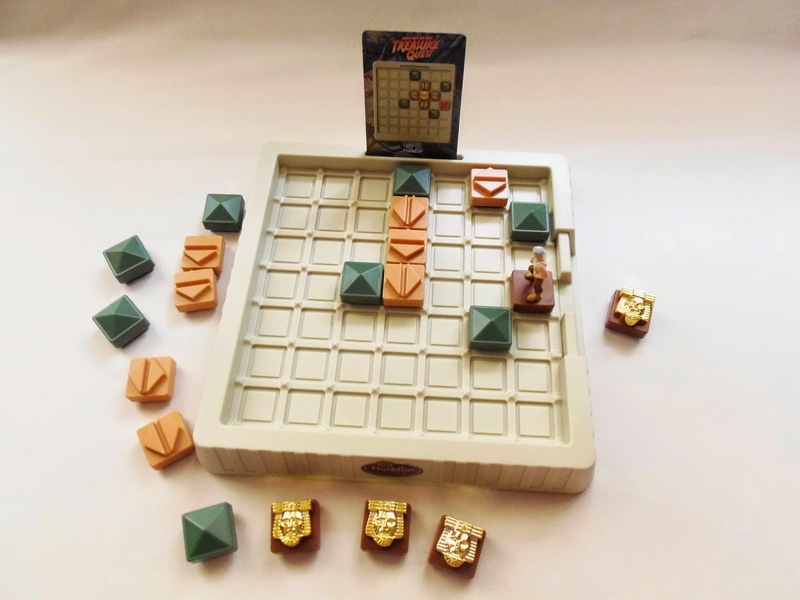 When analyzing the pieces, I noticed that despite there were identical pentominoes, the pieces themselves weren't identical, because of the 40 degree treatment. Even if you flip both apparently identical pieces their shape is slightly different, depending on where they belong in the tray. 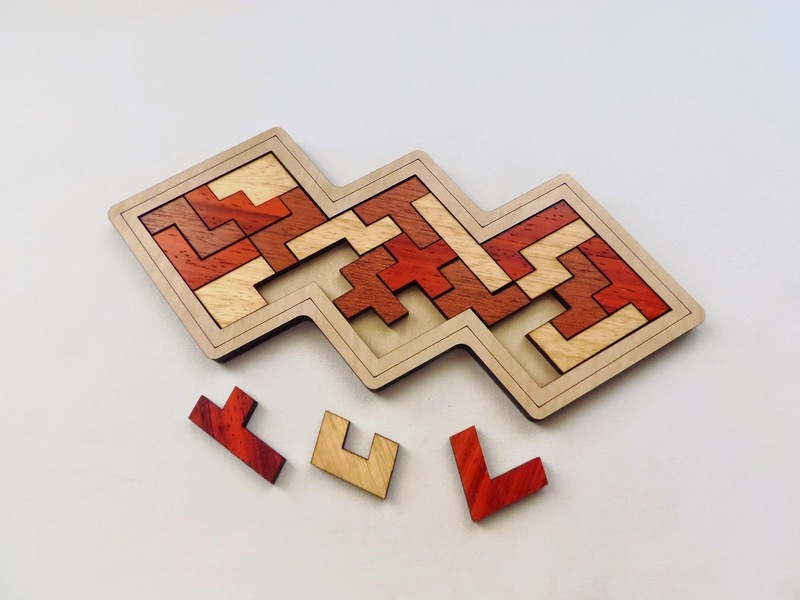 This can actually be turned to your advantage, since you can see where each piece might go in spite of another similar pentomino. I also found that building any shape other than the one outlined by the tray's shape is much more difficult. It's basically a visualization problem, because out of the tray it's harder to see where the limits of the shape are. I was constantly counting the units on a particular shape's perimeter to check if I was solving it correctly. The tilt on the pieces is also hard to get used to, but with practice you'll get better. The more shapes you solve, the better you adjust. The Pentominos "40 Degrees" will keep you occupied as long as you like. The countless shapes you can build with the 20 pentominoes will surely challenge you for years to come. I applause Siebenstein for turning a known concept into something original and challenging. Availability: You can get a copy of the Pentominos "40 Degrees" at Sloyd for €19.50. This week, you can get a 15% discount on this puzzle and all others from Siebenstein-Spiele. You just need to mention my blog upon placing your order. Offer valid until April 25. Die 5 Elemente is yet another gorgeous design by Jürgen Reiche and produced by Siebenstein-Spiele. This might even be the most beautiful puzzle they created so far, and even though I've probably mentioned this about another one of their puzzles in a previous review, it seems like every new puzzle they release looks more stunning than its predecessor. 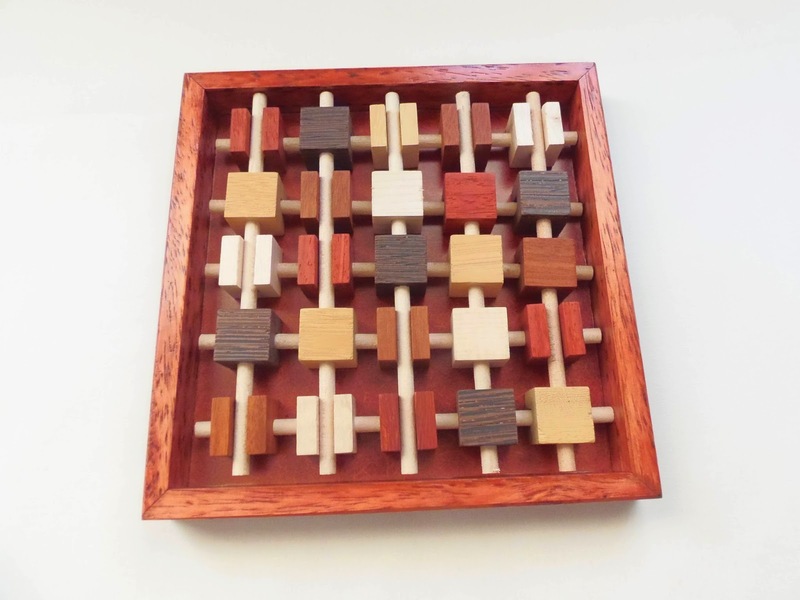 Built using five different colors for the wooden pieces, the puzzle consists of 25 unique squares. How's that possible? Each piece is a combination of a color with a shape (five different shapes available). Since you have five different colors and five different shapes it's possible to combine a color and a shape for all 25 pieces, thus avoiding duplicates. The pieces are laser cut and the shapes are encrusted in the squares to have contrasting colors within each piece. 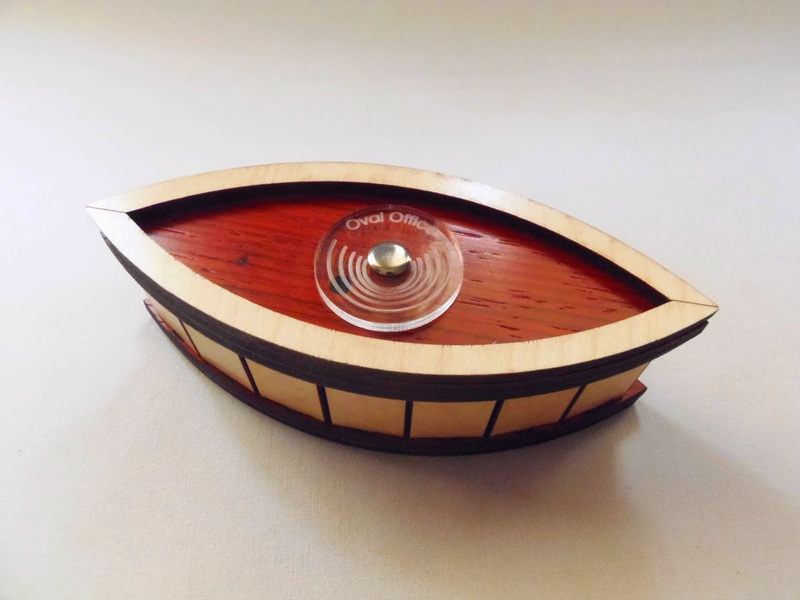 The tray is made of wood and acrylic and measures about 16.5cm in diameter (6.5"). The goal of this puzzle is well known and has been reproduced in countless variations. The original design, to my knowledge, was invented by McLoughlin Bros and dates back to 1888, known as The Giant Puzzle. I reviewed a while ago a modern version of this classic puzzle. Between the two versions (seen below side by side), it's not difficult to guess which one I prefer. Nevertheless, without the original there wouldn't be a version by Siebenstein-Spiele and I'm glad I own both versions. The idea of the puzzle is to arrange all 25 pieces so that no two of the same colors or shapes can be present in any vertical, horizontal or diagonal line. You can start by focusing on one challenge at a time, like avoiding having two of the same colors in any line or just do the shape challenge. When you understand the logic for either one of these two challenges you'll have less difficulty to solve the main one. There's just one way, that I know of, to do this, regardless of the shape you start with at the top left corner. 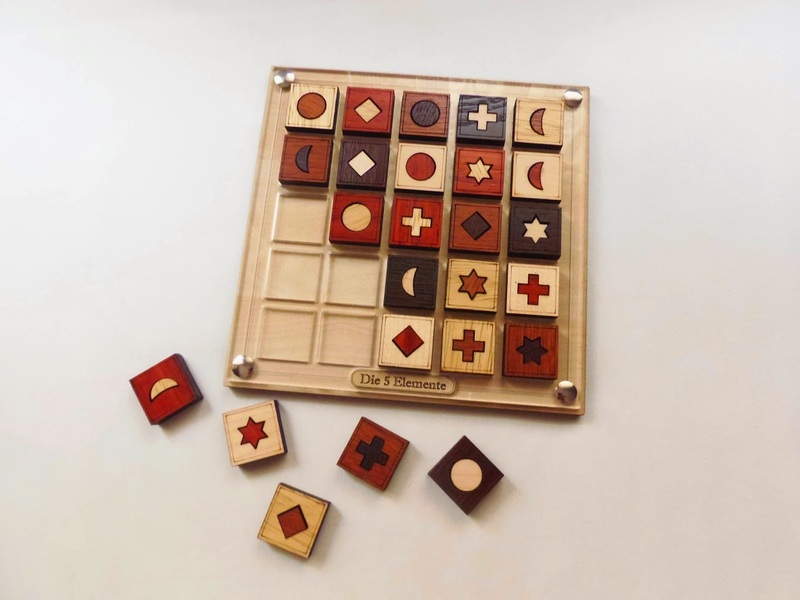 Solving the puzzle may be a little confusing at first, especially because in the Die 5 Elemente each piece has two colors, so you should focus on only one, either the color of the shape itself or the color of the square surrounding the shape. I chose the color of the square because it's much easier to differentiate. To start the correct sequence you just need to choose five unique pieces in shape and color and then place them in either the vertical or the horizontal. It's not important which way you place, but keep consistent as you proceed. The next line you place you just have to follow the same rule and try to not repeat any shape or color. When solved, you'll see that every line follows a specific order. There's no trick involved, just pure logic. 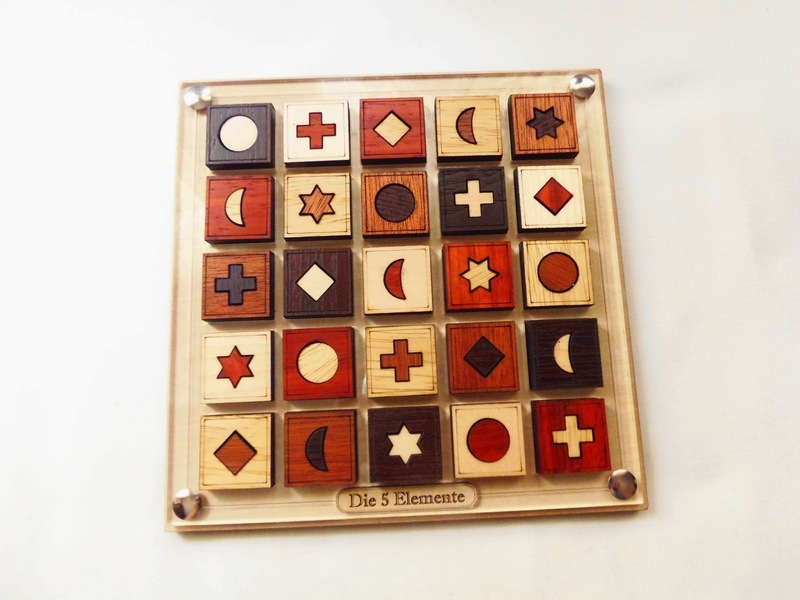 Die 5 Elemente is the perfect coffee table puzzle. It has an easy to understand goal and its stunning appearance will surely make it an easy pick for anyone to try their luck. This is why I love to collect puzzles. Not only the challenge is very enjoyable, but the design also makes it a must-have for any collector. Availability: Die 5 Elemente is currently out of stock at PuzzleMaster, but be sure to check back regularly to see when it's available again. In the meantime, check out other interesting puzzles by Siebenstein-Spiele. 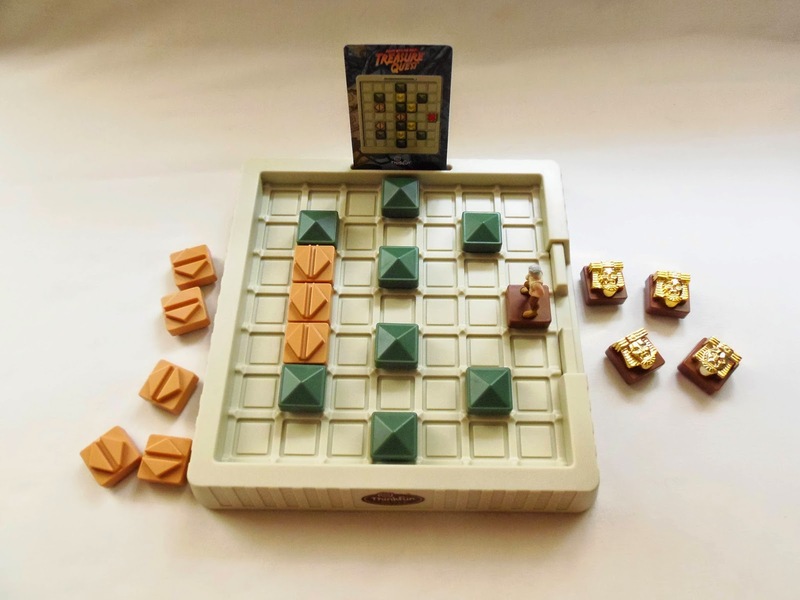 Who doesn't remember playing Sokoban on the computer way back when? I remember playing countless levels and never get bored. The concept was very creative and made the game extremely addictive. 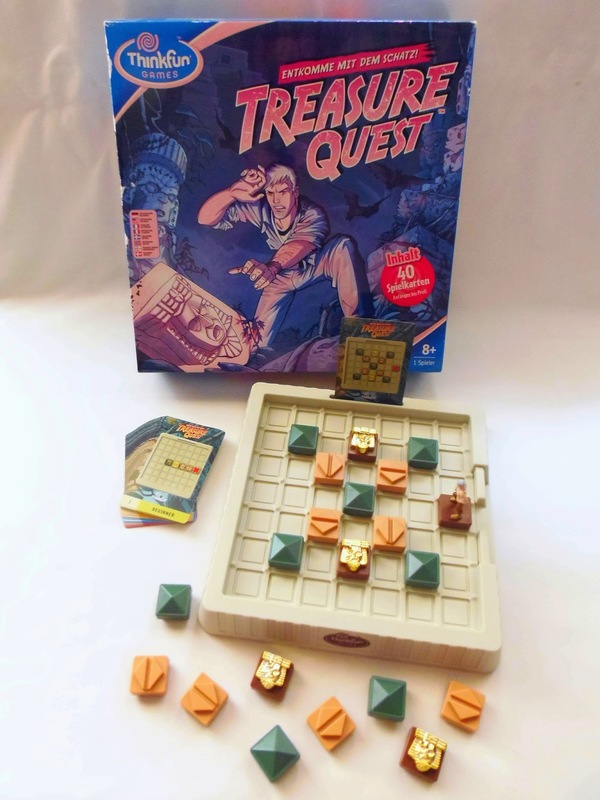 Because I have so many fond memories of the game, I couldn't resist in getting a copy of ThinkFun's Treasure Quest, and finally play the game for real with physical tokens instead of virtual ones. 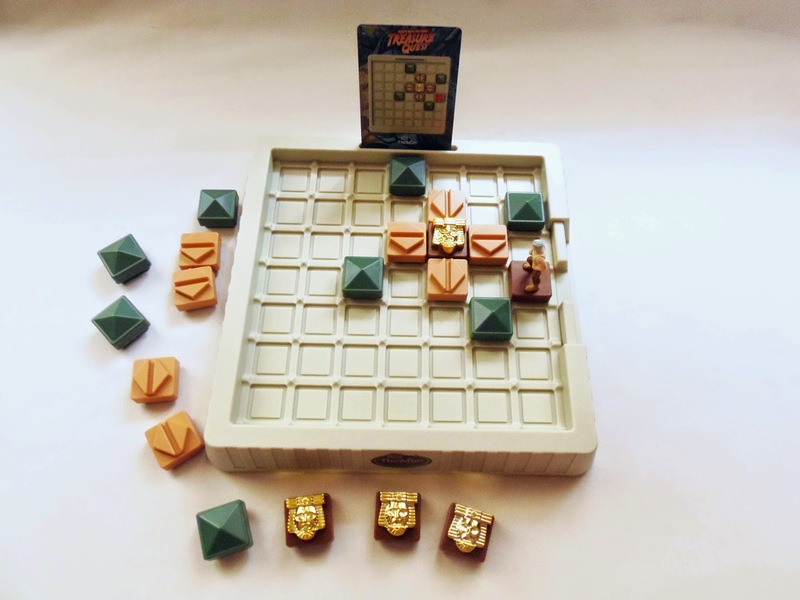 The game was designed by Harry Nelson - I don't want to say 'invented' because the concept already existed - and the 40 included challenges were created by Serhiy Grabarchuk Jr., Hiroshi Yamamoto and also the designer himself. The game isn't an exact replica of Sokoban, so there's merit of the designer in creating something different while still honoring the original. The theme for one, is different between the two games. While the Sokoban had you reorganizing and replacing crates in different spots, in a warehouse setting, the Treasure Quest puts you in the shoes of an Indiana Jones-type character where the goal is to collect gold masks. In the Sokoban game, the crates never left the game area - the goal was to simply replace them neatly together in another part of the 'warehouse'. 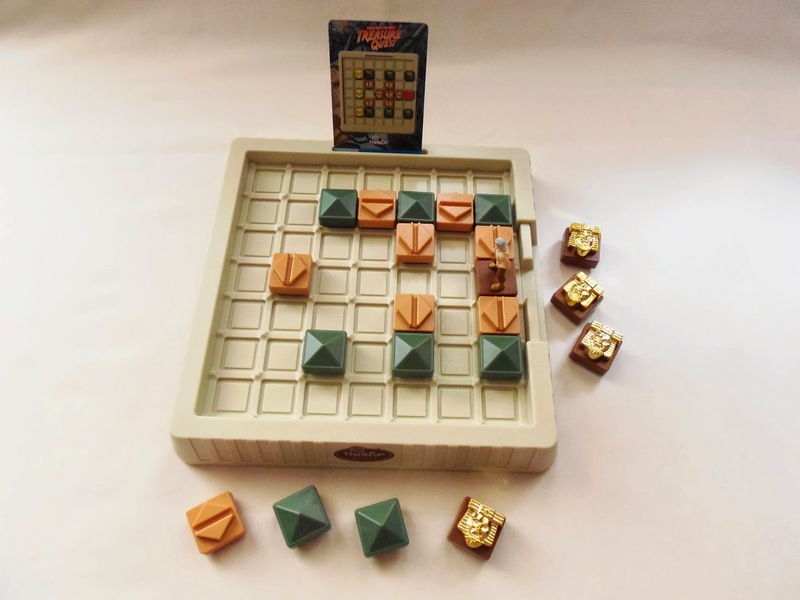 On the Treasure Quest, you not only have to remove the gold masks from the game board - using only one exit - but you need to worry about another rule, the arrow tokens. The arrow tokens can only be moved in the direction they're pointing, so you need to think twice about your moves before executing them. Another interesting difference between the two games is the layout. On the Sokoban, every puzzle had basically a different layout, but the Treasure Quest uses the same 7x7 game grid. 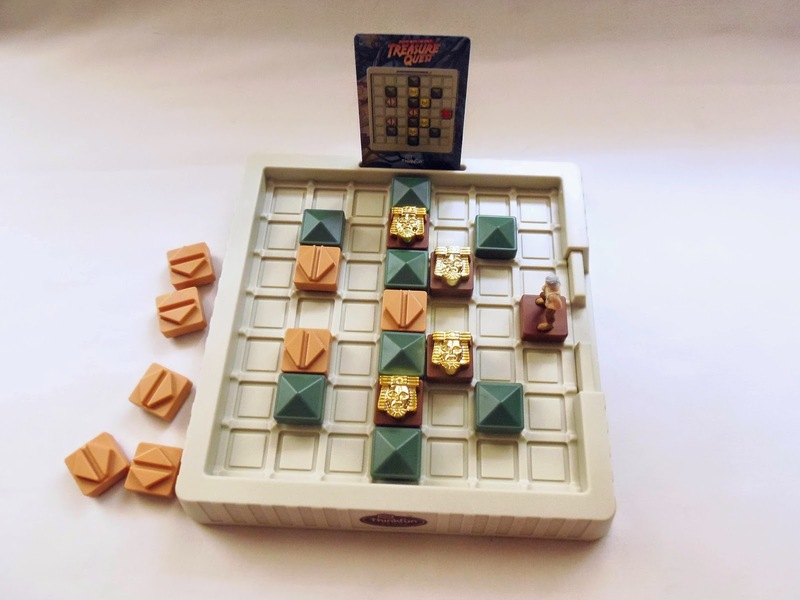 Only the arrangement of the tokens change from puzzle to puzzle. There are a few other things to keep in mind while you attempt to solve any of the 40 challenges: You can't jump over other tokens; Your character can only slide around a token and move one at a time; The green blocking tokens cannot be moved; If a gold mask gets stuck in a corner you're the one getting stuck and you need to reset the game board and start again. The difficulty of the game slowly progresses through the four different levels, from Beginner to Expert, but even the Expert levels aren't that challenging, perhaps because I already knew the concept, but some of them can take a few minutes to figure out, and I needed to reset the board a few times. Thinking a few moves ahead will prevent a lot of resets, though. The Treasure Quest is a great puzzle game, especially if you were (or still are) a fan of Sokoban-style games. My only gripe with it is the small number of available challenges, only 40. The Sokoban had hundreds of them. Unfortunately, this is not an exclusive problem of the game, but actually by ThinkFun themselves, since most of their multiple-challenge games suffer from the same problem. It wouldn't be asking much for at least 100 challenges included in each game. Availability: You can get a copy of the Treasure Quest game at Sloyd for just €16. Taking inspiration in real-life things when designing puzzles is always a nice way to come up with great ideas. Jean Claude Constantin took inspiration, this time, on the White House's Oval Office, although the puzzle's shape is a bit more elongated than the real thing. The Oval Office puzzle is basically a Trick Box, needing only a couple of different moves to open, even though they're not as straightforward as you might think. The design is different from most puzzle boxes you're used to see around. It's intriguing and rather elegant, but that's not surprising when it comes to Constantin, as his designs are always well thought out. 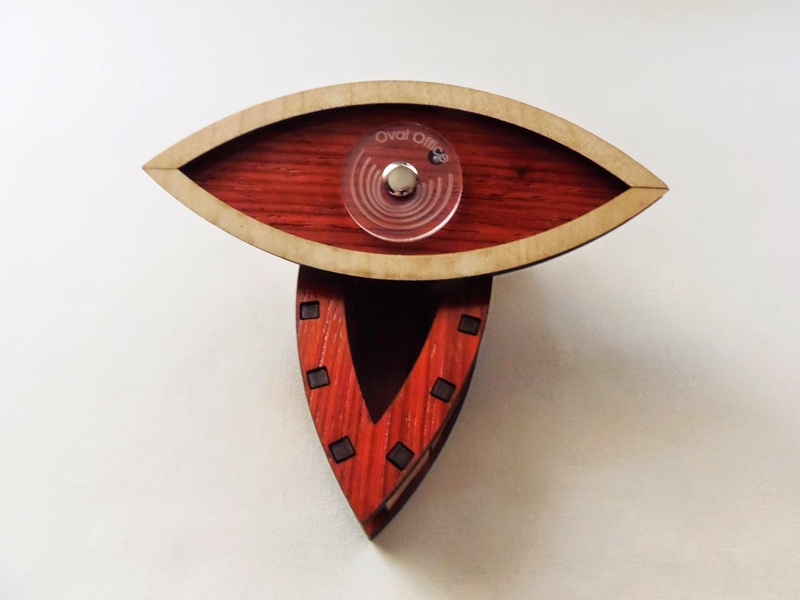 The shape, also reminiscent of the contours of an eye, doesn't give you many clues as to how you should open the box, but if you look carefully you'll soon notice a few interesting features that look too suspicious to be just red herrings. The size of the puzzle is not too big, but still big enough to stash jewelry or other similar surprises - 15cm x 5.7cm x 5cm (6" x 2.2" 2"). The puzzle is rated as a level 7/10, but after being able to solve it in about 5 minutes, I'm thinking it's not that difficult. More like a 6/10. Also, a thorough observation lets you figure out most of its mechanism. On the top you can see a clear disk that rotates, but it doesn't seem to have an effect on the mechanism itself. The transparency of it is not just for aesthetics, though. Almost at the edge of the disk you can see a hole that, as you rotate the top lid (as seen in the photo below), let's you see through it and study the surroundings below. At first you can only push and pull the lid a little to the sides, but that's enough to accomplish the moves necessary to remove the lid. I won't go into further details, but you'll see it's not difficult to figure it out. Despite the fact it's not that challenging, I really liked the mechanism. It uses some elements you usually see in other puzzle boxes, but how they're presented and combined is sufficient to create a different enough concept that can puzzle you for a while. Solution: If you feel like giving up, you can download the solution here. Constantin's Oval Office puzzle box won't keep you occupied for long, but as a fan of his puzzles I wasn't disappointed in the least. Its design is absolutely stunning and will certainly capture the attention of anyone that lays eyes on it, puzzler or not. Availability: The Oval Office puzzle box is available at PuzzleMaster for $38 CAD. 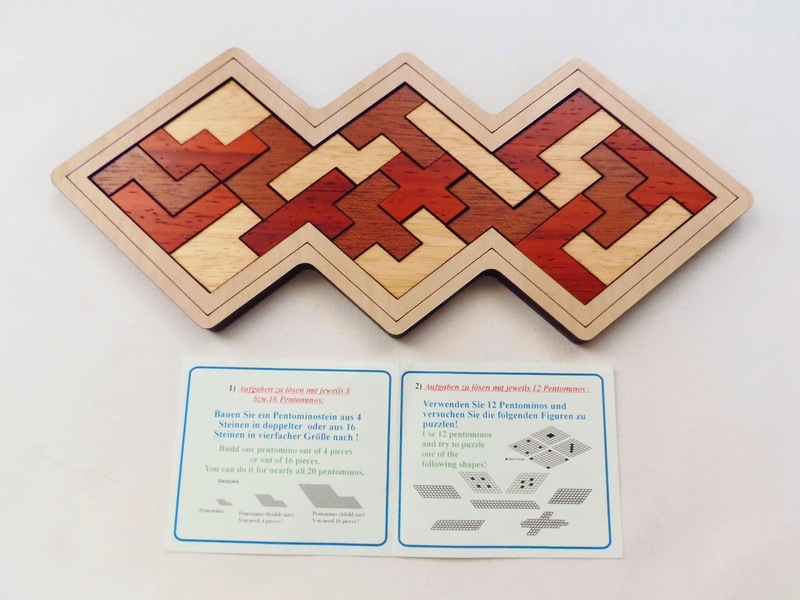 If you like this type of puzzles, check out some more here, or more designs from Constantin here. Puzzle design is an art and Jean Claude Constantin is, to me, one of the greatest artists in this subject. He not only creates amazing new concepts and ideas, but he also has enough creativity to present those designs in a beautiful fashion, always surprising me further with each new creation. The puzzle you see in the photos is called Brochettes (French for Skewers). It's quite rare for Constantin to name his puzzles using other languages other than German, but it's a welcome change. Brochettes consists of 10 skewers, each one unique in color combination and number of cubes. The puzzle comes in its solved state, and the pieces are laid in a 5x5 grid creating a colorful mesh with cubes that looks chaotic at first, but it's actually an organized chaos. Each skewer can have one, two, three or even four cubes attached. 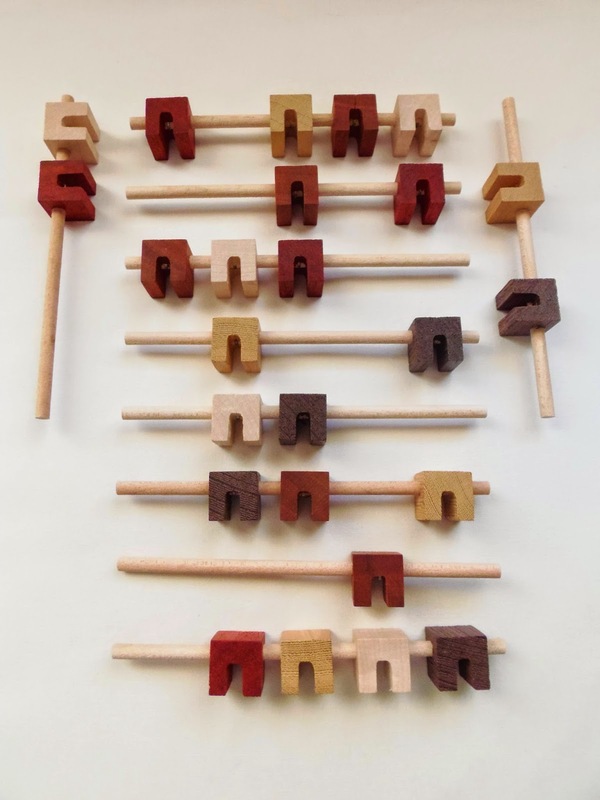 Since the sticks can hold a maximum of five cubes - a limit that's not reached - you will see that it's possible to create different arrangements for the position of the cubes in each skewer. Unlike what you may think, the skewers are not placed in a knitting pattern (a constant movement of underneath and over its perpendicular line). That would be true had the cubes been pointing in opposite directions, but they're actually facing the same direction, as you can see in the photo below, where they are all separated. All cubes have a notch at the bottom so that the sticks can go through them. When solved, the puzzle shows a mixture of the cubes in two possible positions, flat or showing the notch. It doesn't show a particular sequence,though, of which cubes are facing up or down. It's more like a random pattern - that organized chaos. This is quite a challenging puzzle. It's rated as a level 4/5, but don't underestimate it. It can be a 5/5 for some puzzlers. Since there's not anything like this puzzle around, it will be difficult to get a good idea of how it should be solved or the best way to go about it. My strategy, which is a stretch to call it that, was to lay a few skewers on the tray, parallel to each other, and try different combinations with a couple of skewers perpendicular to them and see if I could find a perfect match. This is basically a packing puzzle, albeit a little different from the traditional 2D filling puzzles, so you can't really do much more than trial and error (unless you're going at it with a mathematical analysis). Nevertheless, it still took me over an hour to solve it, so it's definitely a tough nut to crack. Brochettes is a great puzzle. It gives you a new challenge unlike anything you've ever saw, and just for that it's refreshing enough. But it's not just the new concept. The presentation is gorgeous with different kinds of natural wood, something Constantin has already accustomed us with his countless brilliant designs. 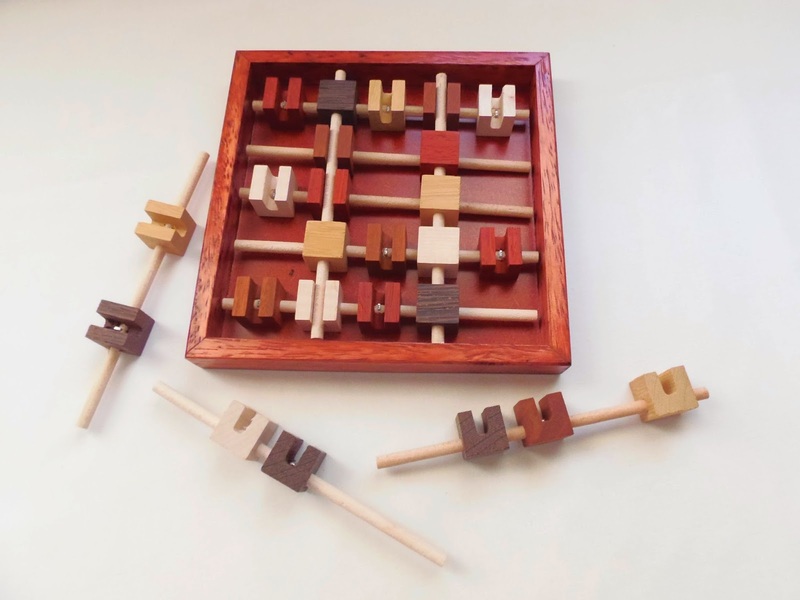 Availability: Brochettes is available at Brilliant Puzzles for about $35 USD. Check out more puzzles of Constantin at their page here.